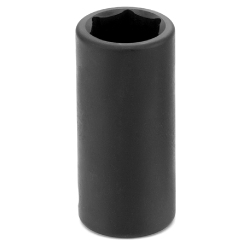 3/8" Drive x 9/16" Semi-Deep Length Impact Socket. Our impact sockets grip the fastener across a broader contact area, reducing chance of rounding off fasteners. They also allow up to 20% more torque to be applied than on other impact sockets. The shift in pressure allows us to reduce the socket wall thickness, increasing access to tight areas.